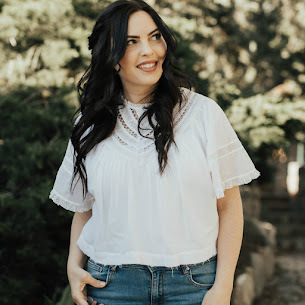 Janelle In Real Life: Freshly Picked Giveaway!! Do you know what's extremely hard to do? Take pictures of your toddler's shoes when he only likes to run and won't sit still. Also, he would not let go of that comb for pictures. I have a beyond active little boy, which is so great... it just leaves me a little worn out. At church on Sunday, we literally spend the whole time chasing him in circles through the hallways because he refuses to sit in the pew with us for longer than a few minutes (and those few minutes we get are only because we have snacks... he loves snacks and running). Since I have a little Forrest Gump on my hands, it's definitely must to have some good quality shoes. For general running around the house and playing outside, these Freshly Picked moccs are sooo amazing! They are high quality, and slip on easily! 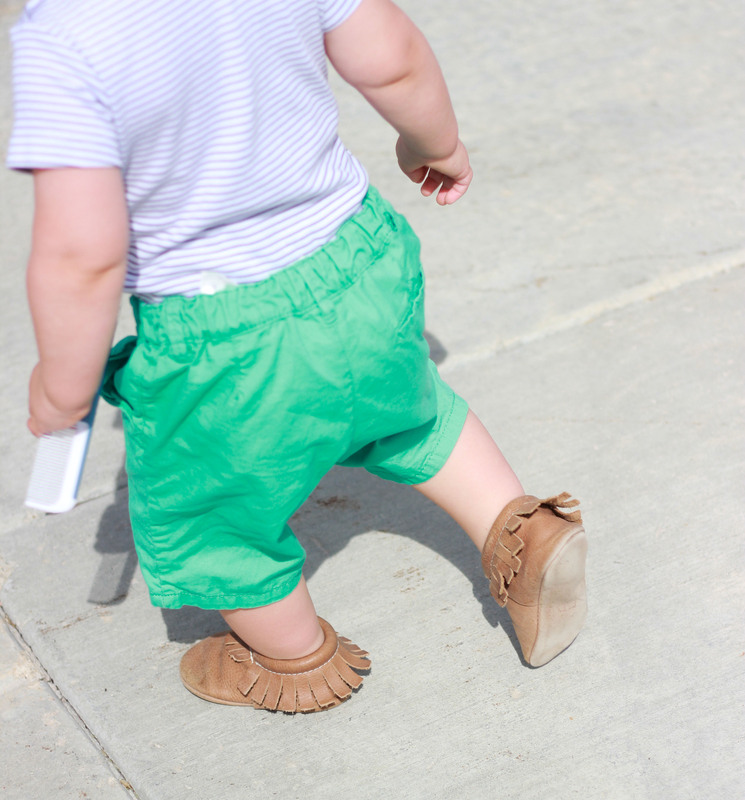 I have a pair of hard soled tennis shoes for the little one to wear if we're going to be at the park or walking for a long time, but the moccs are great for slipping on to just let him run around. 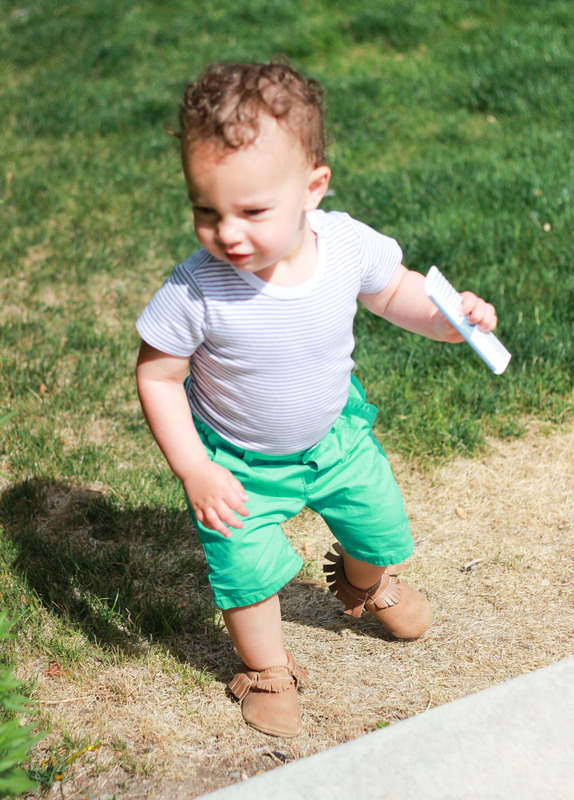 The soft soles are also something that's recommended for little ones who are starting to walk! They are better for helping babies learn balance (and anyone who's seen a baby walk knows that balance is NOT acquired very quickly). I'd heard about Freshly Picked and actually saw the Provo local company on an episode of Shark Tank! They looked pretty cute, but seemed a little expensive to me. I can tell you now that I have a pair for my son... they are worth every penny! Seriously great quality and the design is genius! The shoes have elastic around the ankle which makes them easy to slip on and they actually stay on their feet! These pretty things have been seen on the kids of Kourtney Kardashian, Kim Kardashian,Tori Spelling, Jamie King, and lots of other celebs. 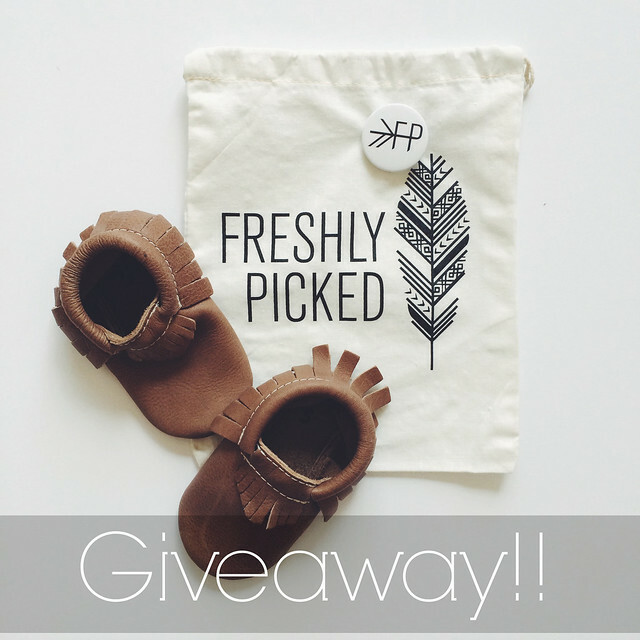 Because I love these baby shoes soooo much, I'm giving a pair away to one of you!! Any color any size... for your little one or for nieces, nephews, baby shower gifts, or whatever! Ah such a good giveaway! These moccasins are so amazing. I would choose the Coral limited edition! The Rose gold, gold and heirloom are my favorites!!! The butterscotch are sooo cute and would match EVERYTHING! I had no idea they had so many color options, it's hard to choose one! I'd go with the classic Sand Suede, since I think they go with everything. I saw these on Shark Tank and loved them, but my son was too young for shoes at the time. He just started walking and these seem like the perfect shoes for wobbly legs. The gray are sooo cute. 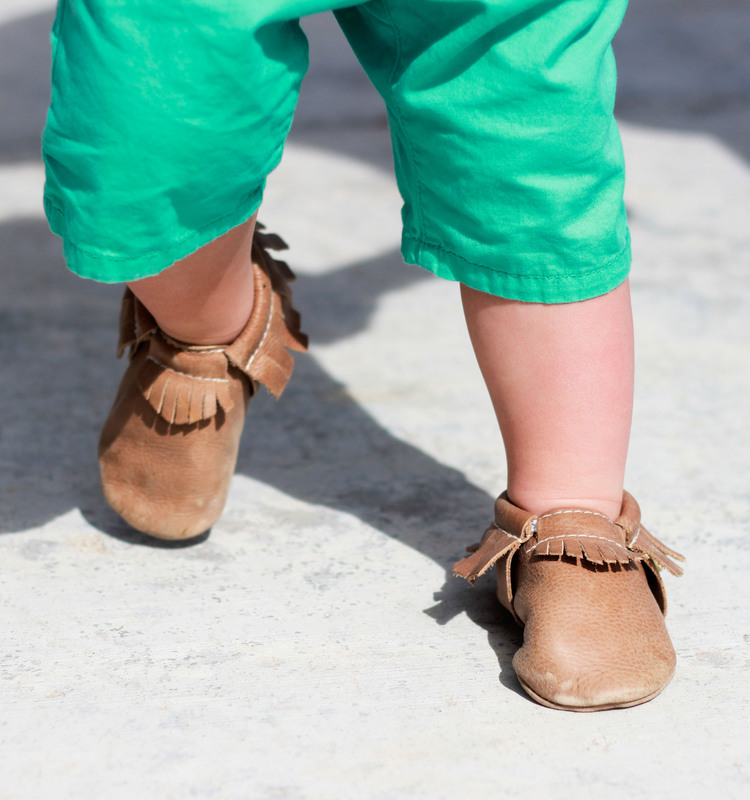 I really like the weathered brown and the stone suede... moccasins just look so adorable on tiny little feet!!! Hi! First of all, your son is just precious! Isn't is funny how they grab onto something & don't want to let it go?! lol The pair I would pick is the Ebony pair. They'd be for my grandson. Thank-you!! Oh my goshhh I want the little brown ones for my baby boy! i really want the price charles color before they go away! The swimmin with the sharks or stone suede!! So cute!! I would like the neon pink or raspberry in size 3. So precious! I love the dark brown your little guy is sporting! I love the white ones with the gold dots! So cute! I love the birch ones! I would have to get the Neon Pink limited edition pair. Too cute!! These are just way too cute! Love them all. I would choose the Coral ones. Thanks! I'd get the weathered brown! I would choose the Frosted Rose. I would get the RED ROCK SUEDE - MOCCASINS. I love the Camo Moccasins. These are so cute. I would have to get the Neon Pink limited edition pair. I would choose the Butterscotch Moccasins. I think I would get the Radiant Orchid but they are all so cute I would probably change my mind several times. those camo moccassins are oh-so adorable! I would pick the Frosted Rose! I love the weathered Brown! I love the iced mint. I would definitely have to pick the platinum or blush moccs for my daughter!